The Cambridge, Massachusetts, of 2017 is a heavily developed, densely populated urban center with a population that has hovered around 100,000 for the past twenty years. Regional differences exist from one part of the city to another, but the sense of Cambridge as a unique, distinct community provides a cement which binds the city together. One hundred and seventy-five years earlier, the situation was very different. The Cambridge of 1842 was a collection of three settlements separated by topography, ideology, and outlook. The three villages of Old Cambridge, Cambridgeport, and East Cambridge were very different communities and their differing needs and wants stretched the capabilities of the town government to the breaking point. Faced with a tenfold increase in population since 1800, chronic town debt, and high taxes, some residents of Old Cambridge sought to resolve the town’s problems by drastic means: secession from the rest of the town. To the honorable Senate and House of Representatives of the Commonwealth of Massachusetts. That the consequence of the rapid increase in the population in these parts of the town lying nearest Boston, and called Cambridgeport and East Cambridge, the town in fact consists of three distinct and separate communities, which are generally known to the public by those names, and each of which has a Post Office recognised in the United States Laws by the said names of Cambridge, Cambridgeport and East Cambridge — That the time cannot be far distant, when a division of the town, for the convenience of elections, and other municipal purposes will be deemed as necessary as it has ever been at any former period of its history, when the towns of Newton, Lexington, Brighton, and West Cambridge, were successively separated from the parent town of Cambridge — Your petitioners believe that the present is a favorable time for an amicable division of the town, and they therefore respectfully pray the town of Cambridge may be divided, and that that part thereof, lying westerly of Lee Street and a line drawn in the direction of said Street, Northerly to the boundary line of Somerville, and southerly to Watertown Turnpike & Charles River may be incorporated as a distinct town by the name of Cambridge. Partition was a fact of life in early New England. As had been the norm for the first generation of Massachusetts towns, Cambridge had originally comprised an enormous tract of land, taking in the present-day towns of Newton, Lexington, Billerica, Arlington, and Brighton, as well as parts of Watertown. These remote areas, far from the focal points of meeting house and market, were gradually “set off” from the parent town — Newton and Lexington before the Revolution, and Arlington and Brighton at the beginning of the nineteenth century. This petition was different, though. Usually a peripheral part of town was set off as a new town. In Bates’s petition, we see Old Cambridge trying to disassociate itself from the rising commercial and industrial centers forming in the eastern parts of town and roll back the clock, as it were, to when Cambridge was a single village centered around the Common and Harvard College. At the beginning of the present century Cambridge contained 2453 inhabitants. It then embraced Little Cambridge [now the town of Brighton], and Menotomy [now the town of West Cambridge]. About 1200 inhabitants probably dwelt at that time within the present limits of the town, and a majority of this number within a half a mile of the college buildings. At a period a little more remote, and prior to the building of the West Boston Bridge in 1794, it was a retired village wearing more the appearance of decay than of progress. What changed this inward focus was bridges. In 1793, private developers opened the West Boston Bridge on the site of the present-day Longfellow Bridge. With the opening of the bridge, the distance from the west to Boston had gone from eight miles to three miles. The turnpikes that were extended to the bridgehead began to bring in more business, and the land east of the town center, which had been home to no more than a dozen families before the Revolution, began to be developed with businesses servicing the trade using the bridge. The poet Henry Wadsworth Longfellow wrote a poem about the bridge he traversed routinely on his trips back and forth into Boston. In short order, Cambridge became a major thoroughfare to Boston and a second community began to arise east of the Common, named after one of the greatest failed ventures in Cambridge history, Cambridgeport. Cambridgeport was born in the minds of Cambridge residents and developers Rufus Davenport and Royal Makepeace in 1803. The proximity to Boston and easy access by water up the Charles river led them to envision a grand scheme for turning this part of town into a major seaport. They managed to get Cambridgeport declared a United States Port of Entry in 1805 and the Cambridgeport Proprietors laid out streets, dug canals and sold lots in anticipation of the growth to come. This was the first period of major growth Cambridge had seen since its first streets were laid out almost two hundred years earlier. The Cambridgeport Proprietors’ plans went sour in 1807 when President Jefferson declared an Embargo and set in motion the train of events that would lead to the War of 1812 against Great Britain. The resulting recession ruined the Cambridgeport Proprietors along with countless others. The canals which were to have been the arteries of the port would become an impediment to development for the next 200 years. Yet despite this, “The Port,” as it came to be called, was still a major thoroughfare and one of the main approaches to Boston. A bustling community soon sprang up around the stores, inns and taverns that serviced the traffic on the bridge. Development was occurring even further east, out on the swampy promontory called Lechmere Point. In 1807 Andrew Craigie and the Lechmere Point Corporation announced plans to build another bridge and their own settlement. Craigie’s plan to develop East Cambridge was substantially different from Makepeace and Davenport’s plan for the Port. His plan was not to compete with Boston, but to capitalize on it. He secretly bought up all the land surrounding the last possible site for a bridge from Cambridge to Boston — the lowlands of Lechmere Point. With substantial financial support from Boston banks and the Middlesex Canal proprietors, he built a bridge on the site of the current Charles River Dam under the Museum of Science, laid out a tight grid of streets, and began an aggressive campaign to incorporate his development into the fabric of Cambridge civic life. Whereas the Port was being developed by Cambridge families, Craigie was an outsider with no loyalty to the town or its ways. His money came from Boston investors. And Craigie was not unwilling to petition the State legislature to come to his aid in a series of disputes with the town. Old Cambridge and East Cambridge got off to a particularly bad start, and the memory of that animosity would hover over town politics for decades to come. While the Port and East Cambridge were undergoing their growing pains, the people of Old Cambridge were undergoing their own trials. In the 1820s several residents abutting the Common petitioned the Selectmen for the right to put a fence around the Common and landscape it, as had just been done in Boston. Originally the common pasture for the townspeople, the Common by 1829 had become a patch of bare ground of indeterminate size, criss-crossed by several roads and turnpikes. To the more liberal-minded townspeople and the lucky few abutting the Common, the idea had great merit. A big dusty field could be transformed into a lovely green park in keeping with the latest thinking on city planning. Proper homage could be paid to the history of the town and icons like the Washington Elm. It would also protect the Common from any future threat of encroachment by developers. The move to enclose the Common was resisted by stockholders in the turnpikes, merchants from outlying towns, and even the town-meetings of Watertown and West Cambridge. The issue was so polarizing that the town hall couldn’t contain the two to three hundred people who routinely attended, so the meetings had to be moved to the meeting house. Some members of the congregation objected to having their house of worship used for this raucous, contentious activity. After a series of overflow meetings the enclosure petition was accepted. The grounds were surveyed, fences erected, and a pasture turned into a park. The enclosure debate made it painfully clear that Cambridge needed a new, larger town hall, but land prices in the village were prohibitive even in the 1820s. A debate arose over moving the town hall, pitting the Old Cambridge lobby, who resisted moving the seat of town government from its ancient site, against the other parts of town. The Port wanted to have the town hall as a mark of distinction, and East Cambridge men were willing to support the move because it meant a shorter walk for them, and it was a snub to the Old Cambridge elite. A lot in Cambridgeport was chosen and a new structure built. Instead of a single village, with a single circle of interests, there were now three villages, with interests diverse and sometimes conflicting as regards the expending of public money, so that feelings of sectional antagonism were developed. In New England history the usual remedy for such a state of things has been what might be called ‘spontaneous fission.’ The overgrown town would divide into three, and the segments would go on pouting at each other as independent neighbors. Old Cambridge was synonymous with Harvard College, and after the relocation of the town hall and all the town offices the College became the only claim to fame the village had. It possessed many lovely houses and gardens, but little else. Cambridgeport had survived its rocky beginning to become a thriving mercantile neighborhood. It boasted seven churches, the town hall, and other municipal offices. The largest railroad car factory in the country was Davenport’s on Main Street. The Cambridge Directory for 1847 said it “is quite a business place; and is in a high state of prosperity.” East Cambridge had become a center of heavy industry in the town. New England Glass alone employed two hundred workers; other factories in the neighborhood made brushes, furniture, and boilers. It was also home to the less glamorous public offices such as the county courthouse, jail, and House of Correction. In 1842, the neighboring town of Charlestown voted to set off the part of town beyond Charlestown neck as the town of Somerville. The reason given for the separation was not that it was too far for residents of one part to get to town meeting, but that the individual characteristics of the two parts of town had become so different — one industrial and maritime, the other rural and agricultural — that they should become two separate towns. This event did not go unnoticed in Cambridge. Old Cambridge, Cambridgeport, and East Cambridge were at least as different in character as Somerville and Charlestown. The most vexing issue of the petition, and probably the reason the Legislature voted to postpone discussion of the matter until the next session, was the issue of identity. In petitions for partition, a newly created town would be “set off” from the parent town, take a new name, and form its own government. The name and records of the parent town remained with the parent. But in Bates’s petition, the new town would take the name of Cambridge, leaving the rest of Cambridge to come up with some new name. The confusion in legal and government documents would be enormous. More pragmatically, several of the remonstrances noted the expense it would place on the county in the form of stationery, since all the court records of Middlesex County had the word “Cambridge” on them and would thus have to be redone with whatever new name the abandoned part of town adopted. The petition is also vague on the intended outcome of the partition. Would Cambridge become two or three towns? It is implied that the town had become three distinct communities, so it seems to suggest that each would become its own town some day. Yet no boundaries are mentioned, nor details offered for the “expatriated” parts. Unlike the Somerville, Brighton, and Arlington petitions, each of which prayed for a specific division of land in one town and the creation of a new municipality in addition to the parent town, the Old Cambridge petition took one town, created one new town with the same name, and left at least one town up in the air. They take to themselves the best part of the town, leaving the poorer parts, the lowlands and marshes, to the expatriated portions . . . The whole town . . . is only about four miles, and it is, in no part; over two miles in width . . . So that its size can afford but very little ground for an argument in favor of a division. What would prompt a sizable portion of Old Cambridge voters, including Harvard professors Simon Greenleaf and Joseph Story, the poet Henry W. Longfellow, and West Cambridge ice seller Nathaniel J. Wyeth to sign this document? The diminishing importance of Old Cambridge in town affairs, a desire to recapture the “small town” feel of Cambridge, and the increasing financial strains imposed on residents by decades of expansion were the primary motives. Another concern to fiscal conservatives was the town’s financial health. By 1842 it had turned quite sour. Starting around 1830, the town greatly increased its infrastructure by accepting private roads as public ways and by increasing school expenditures to accommodate the rising population. 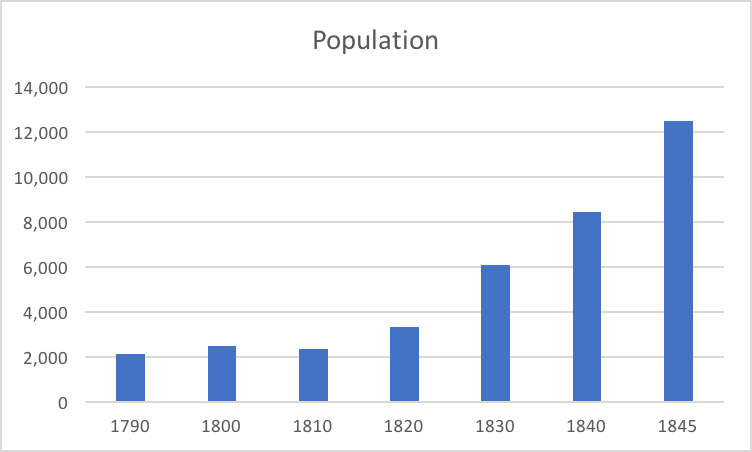 The chart below shows how dramatic the influx of population was. Since most of the new development was happening in the eastern part of the town, a natural tension arose. The residents of the western part of town were paying more every year to build new schools their children didn’t attend and roads they didn’t use. The residents of the eastern parts of town felt equally strongly that it was unfair that they should have to pay for the upkeep of streets in Old Cambridge, yet when they petitioned to have their streets accepted as public ways, the Old Cambridge faction would loudly complain about the cost. This was especially vexing in the case of the major thoroughfares to the bridges, which were used by Old Cambridge residents to get to Boston and back. This rising yearly maintenance issue was made worse by the lack of financial oversight of the town’s spending. There were several official entities with the power to draw on the treasury and none of them were accountable to anyone. When the town began issuing printed annual reports of its finances in 1830, the assessors did little more than make sure that the numbers added up. By 1840, the town was borrowing money against its anticipated tax revenues and the assessors began making polite suggestions that more control be exercised over the town’s purse. The assessors’ predictions for 1842–43 were so bleak that a petition was filed to reorganize the town government and combine the manifold committees and boards into one with authority over a broad range of affairs. It was hoped that this would help control the rising taxes, but the petition languished for three years before being dropped. In January 1843, the Legislature ordered Bates to publish his petition in the local papers by February 10, 1843. Public reaction was swift on both sides. Captain Nat Wyeth gathered 84 signatures affirming Bates’s petition. The editor of the Bunker-Hill Aurora published a long editorial attacking the petition and the hidden motives of the subscribers. The February town meeting voted 387 to 0 to oppose the petition and sent a resolve to that effect to the Senate. The Senate decided to defer the whole matter for the 1844 session and the matter simmered for the rest of the year. Both Bates and Wyeth were elected Selectmen in 1843, giving the secessionists two votes out of five on the Board. In December 1843, Dr. Morrell Wyman submitted a petition that was almost a word-for-word copy of Bates’s, except that his new town would be called “Old Cambridge,” thus defusing one criticism of the original petition. At the January 1844 town meeting, the petitions were again opposed although this time far from unanimously, the final vote being 312 to 78. The Senate voted in March 1844 to give Bates leave to withdraw his petition. The town would remain “one and inseparable” for the moment. The next few years saw continued turmoil in town politics. Town finances remained shaky and taxes continued to rise. Bates never held another public office after 1843, devoting his energies to managing his properties. The town would vote against consolidating the Boards into one central Board in 1845 and after heated debate would petition the Commonwealth to incorporate as a city in 1846. Incorporation answered some of the problems Jacob Bates hoped to solve by seceding from the town, but not all of them. It could do nothing to address the loss of prestige and later Old Cambridge writers would look back fondly at the village and its vanished way of life with regret. Longfellow’s village blacksmith was a perfect embodiment of that lost Puritan ethic — the hard-working, pious, small town citizen. The secessionists had to accept the defeat and get used to the idea of living with the Port and East Cambridge. By and large, they did. The first mayor of Cambridge had originally supported the secession petition, and by the 1850s the Common Council was dominated by the same men who had dominated town government in the forties. By the end of the century, the population had expanded so much that the three separate villages had become a single urban sprawl, and the boundaries of the villages blurry things in the minds of the younger generations. Jacob Hill Bates 1788-1861 was born in Weymouth, MA. He owned several properties in the Harvard Square area and had properties in New Hampshire and Western Massachusetts. His papers at the Cambridge Historical Society consist primarily of records of his financial dealings. Massachusetts Archives, State Senate documents of 1843–44, bundle S11577. The Cambridge Chronicle, Thursday, May 7 ,1846. Lucius R. Paige, History of Cambridge, Massachusetts 1630-1877 (Cambridge, the Riverside Press), 176-180. Cambridge Historical Commission, Survey of Architectural History in Cambridge, Report Three: Cambridgeport (Cambridge: MIT Press, 1971), 16. Cambridge Historical Commission, Survey of Architectural History in Cambridge, Report Three: Cambridgeport, 20. Paige, History of Cambridge, Massachusetts 1630-1877, 183. Paige, History of Cambridge, Massachusetts 1630-1877, 185-8, 203-214, and Cambridge, Town Records, Vol. D. 1806-1830. Paige, History of Cambridge, Massachusetts 1630-1877, 214-215. The Washington Elm stood at one edge of the Common and was a favorite symbol of nineteenth century romantics. It was said that General Washington first took command of the Continental army under the elm’s branches. Paige, History of Cambridge, Massachusetts 1630-1877, 235-239. Paige, History of Cambridge, Massachusetts 1630-1877, 239. Paige, History of Cambridge, Massachusetts 1630-1877, 238. Paige, History of Cambridge, Massachusetts 1630-1877, 241. John Fiske, “Oration,” in Cambridge Fifty Years a City 1846-1896, ed. Walter Gee Davis (Cambridge: Riverside Press, 1897),35-40. The Cambridge Directory (Cambridge, 1847), 25. The Cambridge Directory (Cambridge, 1847), 43. The Cambridge Directory (Cambridge, 1847), 44. Bunker-Hill Aurora, February 11th, 1843. Captain Nathaniel Jarvis Wyeth (1802–1856) was hardly the picture of stodgy Old Cambridge elitism. A member of a large old family with extensive property around Fresh Pond, Wyeth had spent most of the early 1830s exploring the newly-opened Oregon Territory trying to corner the fur trade. Upon his return to Cambridge, he resumed working in the ice business and pioneered the business of shipping ice overseas. Cambridge, Town Records, Vol. D, 1806–1830, and Vol E, 1831–1845. See Henry C. Binford, The First Suburbs: Residential Communities on the Boston Periphery 1815-1860 (Chicago: University of Chicago Press, 1985), 121, as well as Joseph Beale, “History of Local Government in Cambridge” in CHS Publications 22 (January, 1932). The Cambridge Directory (Cambridge, 1847). Cambridge, Town Records, Vol E, 1831–1845. Cambridge, Annual Reports of the Board of Assessors of the Town of Cambridge 1830–43.